Colin Rule explains how online dispute resolution works and how it has the potential to fill access to justice needs. Not all legal disputes require the input of a lawyer. Some don’t even need the input of a human. Online dispute resolution (ODR), or the use of technology to solve basic disputes, is considered by some to be an access to justice solution. In this episode of The Digital Edge, hosts Sharon Nelson and Jim Calloway talk to Colin Rule about how ODR works and its potential to fill access to justice needs. They also discuss where ODR originally came from, the difference between between ODR and alternative dispute resolution, and how mobile access will expand the use of this technology. Colin Rule is vice president for online dispute resolution at Tyler Technologies. Tyler acquired Modria.com, an ODR provider Colin co-founded, in 2017. 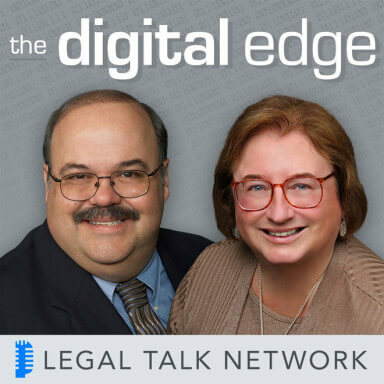 Intro: Welcome to The Digital Edge with Sharon Nelson and Jim Calloway, your hosts, both legal technologists, authors and lecturers, invite industry professionals to discuss a new topic related to lawyers and technology. You are listening to Legal Talk Network. Sharon D. Nelson: Welcome to the 122nd edition of The Digital Edge Lawyers and Technology. We are glad to have you with us. I am Sharon Nelson, President of Sensei Enterprises, an information technology, cyber security and digital forensics firm in Fairfax, Virginia. Jim Calloway: And I am Jim Calloway, Director of The Oklahoma Bar Association’s Management Assistance Program. Today, our topic is Expanding Access to Justice Through Online Dispute Resolution. Sharon D. Nelson: Before we get started we would like to thank our sponsors. Thanks to our sponsor Clio. Clio’s cloud-based practice management software makes it easy to manage your law firm from intake to invoice. Try it for free at HYPERLINK “http://www.clio.com/”clio.com. Thank you to Answer1, a leading virtual receptionist and answering services provider for lawyers. You can find out more by giving them a call at 800 Answer 1 or online at HYPERLINK “http://www.answer1.com/”www.answer1.com. Jim Calloway: Thank you to Scorpion. Scorpion sets the standard for law firm online marketing with proven campaign strategies to get attorneys better cases from the Internet. Partner with Scorpion to get an award-winning website and ROI positive marketing programs today. Visit HYPERLINK “http://www.scorpionlegal.com/podcast”scorpionlegal.com/podcast. Thanks to ServeNow, a network of trusted prescreened process servers. Work with the most professional process servers who have experience with high volume serves, embrace technology, and understand the litigation process. Visit HYPERLINK “http://www.serve-now.com” www.serve-now.com to learn more. We are very pleased to have as our guest our Colin Rule, who is the Vice President of Online Dispute Resolution for Tyler Technologies. In 2011 Colin co-founded HYPERLINK “http://www.Modria.com” Modria.com, an ODR provider based in Silicon Valley, which was acquired by Tyler Technologies in May 2017. From 2003 to 2011 he was Director of Online Dispute Resolution for eBay and PayPal. Thanks for joining us today, Colin. Colin Rule: Thank you, Jim; great to be here with the two of you. Sharon D. Nelson: Well, Colin, let’s start out by helping people who might not be as familiar with the subject as the three of us are. I think most people recognize the words “Online Dispute Resolution”, but maybe you could define it a little more precisely. Colin Rule: Sure, I bet a lot of your listeners have heard of Alternative Dispute Resolution, which is like face-to-face mediation and arbitration, really systems for helping people resolve their disputes outside of court. Well, Online Dispute Resolution is an outgrowth of Alternative Dispute Resolution, and really it’s just the use of information and communications technologies to help disputants prevent, manage, and resolve any disputes that they encounter. So, that’s a pretty broad umbrella of different tools and techniques, that means the telephone is a powerful online dispute resolution technology, an LCD projector can also be a powerful technology, but obviously, most of the work we do in an online dispute resolution field utilizes the Internet. Jim Calloway: And how did you get involved in ODR? Colin Rule: Well, it’s a great question. I am a big nerd. I have loved technology in my whole life and I also got involved with Alternative Dispute Resolution. Very early I was trained originally by the Quakers when I was in college in mediation, and thought, boy, this is what I want to do, and that was in the late ’80s, but there really was no online dispute resolution until really the late ’90s, and that was when I realized, oh, my gosh, I love technology and I love dispute resolution. I might be perfectly positioned to sort of bring these two things together. So, that’s really what I’ve been working on for the last 20 years or so. Sharon D. Nelson: So, where did Online Dispute Resolution come from originally? I don’t think many people know the origin very much. Colin Rule: Yeah, it really came out of e-commerce, so if you think back to the ’90s, that was when the Internet was starting to get traction and people were starting to buy things online. Companies like eBay started to have lots of transaction volume between buyers and sellers and disputes were cropping up. These are high volume disputes, but really low value. The average value of an eBay dispute is like 75 bucks, and the consumers, the buyers, and sellers are all in different countries. So, it really didn’t make sense to take them into the courts, try and find lawyers to represent parties for $75 dispute, especially when the jurisdiction was so confused. So, eBay and other e-commerce pioneers like Amazon, they realized they had to build their own resolution processes. So, they built the earliest Online Dispute Resolution platforms in the late ’90s and early aughts, sort of flowered into this kind of whole justice layer for the Internet, which is creating fast and fair redress for consumers in e-commerce transactions. And now the rest of the world has looked at some of the tools that have been built by these giant Internet companies and said, hey, maybe we could use that for insurance cases or property tax appeals or now the courts. So, it came out of e-commerce and now it’s spreading to really the rest of the justice sector. Sharon D. Nelson: And you were involved; weren’t you calling in the eBay Online Dispute Resolution? Colin Rule: Yeah, I was the first Director of Online Dispute Resolution at eBay. I was running another ODR provider called Online Resolution, but one of my competitors was a company called SquareTrade and they were doing all of the ODR for eBay, but eBay said, wow, this is so important to us, we can’t just outsource it, we need to bring it inside. So, one day they called me up and they said, we want you. I wrote a book called ‘Online Dispute Resolution for Business’ in 2002 and they found that book on Google and said, we want this guy. So, that was how I ended up be eBay. But yeah, we ended up resolving 60 million disputes per year at eBay, which depending on how you count, that’s bigger than the US Civil Court system, so that was hundreds of millions of disputes over the years that I was at eBay, but Amazon does more disputes than eBay does, and there’s another company called Alibaba, which is a big e-commerce marketplace in China that does more disputes than Amazon. So, I estimate there is more than a billion cross-border e-commerce disputes in 2017 and that’s growing about 30% a year. Sharon D. Nelson: I had no idea, Colin, none at all. Colin Rule: Well, it’s interesting, we are building a new society out in cyberspace, it’s cross-border, I mean, any of us can pull our phone out of our pockets and swipe, swipe, swipe, we buy something from someone on the other side of the planet and the justice systems that we have are tied to geography, if it’s a dispute between a buyer in Argentina and a seller in Paris based on an e-commerce marketplace in the US and the item is drop-shipped out of China, I mean, our current legal system really can’t make heads or tails out of that because it’s the jurisdiction, it’s just too confused. So, all of these Internet companies are really building a new justice system to handle these cross-border cases, but they are investing so much and there’s so much innovation, it can also benefit offline face-to-face dispute resolution caseloads as well. Jim Calloway: Well, I am sure that lawyers could figure out how to make heads or tails if it’s a million-dollar item that’s being shipped, but a lot of these can’t really stand legal fees involved. Many lawyers have heard of Alternative Dispute Resolution, how does Online Dispute Resolution relate to Alternative Dispute Resolution? Sharon D. Nelson: You can always get a name changed. Colin Rule: Yeah, that’s true, that’s true, maybe when he gets older he will opt into that, although he is a teenager now, so he’s not that happy about the ADR thing to begin with, but my wife jokes that I am in the odor field, like really, you couldn’t pick a better name, sounds – it smells like perfume, or cologne, the odor feel, but a lot of the tools and techniques in Online Dispute Resolution you can draw a direct line back to Alternative Dispute Resolution. So, we have negotiation, we have mediation, we have arbitration, those are the traditional mechanisms in a face-to-face dispute resolution. But, ODR also expands the toolbox a little bit. One of the things we can do online is we can actually get access to the complainant in a dispute before they even notify the respondent that they have a concern. So, that lets us create this initial phase that we call “Diagnosis”, which really works with the parties in advance of the two of them starting to communicate with each other and that can be very helpful in setting what we call the ZOPA, the Zone of Potential Agreement between the complainant and the respondent before they start really going at each other; and then, potentially undermining the trust that is so important to reach an agreement mutually. So, we also have on the evaluative side, a lot of people think about arbitration, and of course, arbitration then court hearings, you usually have a single person or maybe a panel of arbitrators that render a decision. But, one of the things that we did at eBay was we created what we call the Community Court, and if a buyer and a seller had the disputes, they could bring it into the community court, lay out their issues, lay out their perspectives, and then we would bring in community members, who we tested to make sure they never transacted with the buyer or the seller, they would all hear the evidence and then they would weigh in and say who they thought should win. And that’s not three panelists or five panelists, sometimes we had 50 panelists or a 100 panelists or 500 panelists. So, this whole notion of crowd-sourced evaluative dispute resolution processes, it’s incredibly impractical if not impossible in the face-to-face world. But, online, it’s actually pretty easy to do. So, that’s an interesting fusion of democracy, crowd-sourcing and dispute resolution. So, ODR opens a lot of possibilities but they just add on to the core concepts we have in face-to-face dispute resolution. Jim Calloway: That is very interesting. Before we move on to our next segment, let’s take a quick commercial break. Looking for a process server you can trust, Serve-Now.com is a nationwide network of local prescreened process servers. ServeNow works with the most professional process servers in the country. Connect your firm with process servers who embrace technology, have experience with high volume serves, and understand the litigation process and the rules of properly effectuating service. Find a prescreened process server today. Visit HYPERLINK “http://www.Serve-Now.com” Serve-Now.com. Sharon D. Nelson: Imagine what you could do with an extra 8 hours per week. That’s how much time legal professionals save with Clio, the world’s leading practice management software. With intuitive time tracking, billing and matter management, Clio streamlines everything you do to run your practice, from intake to invoice. Try Clio for free and get a 10% discount for your first six months when you sign up with the code TDE10. Of course, you can find Clio at HYPERLINK “http://www.clio.com” clio.com. Sharon D. Nelson: Welcome back to The Digital Edge on the Legal Talk Network. Today, our subject is, Expanding Access to Justice through Online Dispute Resolution and our guest is Colin Rule, who is Vice President of Online Dispute Resolution for Tyler Technologies. So, Colin, let’s put some flesh on the bones here. How does ODR actually work? Colin Rule: Yeah, so Online Dispute Resolution is applied in a wide variety of different dispute types, and what we’ve seen is the most effective way for ODR to generate resolutions, is to really intimately integrate it into the environment where the interactions are happening in the first place. So, that’s pretty much what’s happening in the e-commerce context, you’re seeing ODR integrated into all these marketplaces and not just e-commerce item marketplaces, also service marketplaces like Airbnb or Uber or TaskRabbit. Any place that has a market of service providers and service consumers, there are going to be disputes; so, ODR is just built right in. But now, what we’re seeing is it’s being applied especially in the courts. The courts are looking at the online dispute resolution tools and techniques to try and promote resolution in advance of hearings. So, if you think about the way ODR works, it’s almost like a staircase where when the process starts out we have sort of a diagnosis, communication or intake process. And then, once you get through the intake process and there’s a clear description of what the problem is about and what the preferred solutions are from each side, then you enter into a negotiation, which is just where the parties communicate with each other online, to try and come up with mutual agreement. Now, if they can’t reach an agreement in a negotiation phase, they can invite a third party expert to come in and assist them. So, we call that Online Mediation, which is just assisted negotiation. The third party doesn’t have any decision-making authority. But, if they can’t work it out with the assistance of a mediator, then it goes to evaluation, and that’s where a third party, may be the same person, who is serving as a mediator, but also it could be somebody totally new, comes in listens to both sides and renders a decision. So, the goal of ODR is to get resolution as early as possible in the life of the dispute. And the objective also is to achieve an outcome by mutual agreement wherever possible and only to rely on evaluative outcomes in situations where the mutual agreement is impossible. Another thing that’s very exciting about ODR, is the idea that technology can play a key role in helping the parties reach agreement. And one of the concepts we have in ODR is something called the Fourth Party, where technology is a party to the dispute much like party one and party two, the disputants, and the third party, which is the human-neutral, technology is the fourth party. And, as computers get more-and-more powerful, the fourth party is getting smarter and smarter. So, maybe one day, we’ll rely on the fourth party to decide our disputes for us. Jim Calloway: I’m not sure I really understand the fourth party? Colin Rule: Yeah, you can think of it as almost like a friendly robot, that’s sitting at the table with you. So, you’ve got the two disputants, the complainant and the respondent, and the human-neutral, a mediator or you can envision it as like an Amazon Echo, sitting on the table. So, this notion of the fourth party, it’s a theoretical way that we think about how technology can effectively participate in a dispute resolution process, and the fourth party is there to help the other three parties. So, imagine that you’re having a dispute with the other side and you’re arguing back and forth and the mediator is trying to help you, and then you say to the little Amazon Echo on the table, Alexa, what do you think a fair resolution to this dispute would be? And that little Amazon Echo could go out and look at millions of cases and crunch a lot of numbers and come back and say, well, it appears to me a fair resolution would be this. Now, that doesn’t mean that the Echo is deciding the dispute, it’s advisory. And all in the parties, the one, two, and three parties can ignore that information, but that’s an idea of how technology can be helpful to disputants, when they get into a dispute in terms of providing information, structuring the process, and then generating settlement agreements. Sharon D. Nelson: Colin, how can parties be sure that the information they share in ODR will stay confidential? I think everybody worries about anything that they send up to somewhere in the ether, who can read this, what can happen to this stuff, can this be used against me? What would you tell them if they’re worried about confidentiality? Colin Rule: Yeah, that’s the number one thing I hear from parties when they are concerned about taking their dispute resolution process online. It’s almost inevitable that the information we share in our disputes is sensitive and we don’t want that information to be made public. Now, there are some circumstances like on eBay, where an aggrieved party wants to shout from the rooftops, but most of the time people really want their information to be protected. And one of the things that worries me, that’s happening in the dispute resolution field is I see a lot of mediators using tools like email, Skype, other types of online communication to communicate with their parties. And we have a core ethical obligation in the dispute resolution field that we’re going to protect the confidentiality of the information our parties share. But the use of those kind of free and open tools, means that that information is not really that well-protected. And if somebody from the outside wanted to get access to it, it might be easier for them to do so than if it was in a secure platform. So, one of the good things about a system like what we have at Modria is we require logins from all the participants. We track their participation and we can protect the information, the files and communications submitted in the platform because they’re kind of within the walled garden of our website. So, it is really an important thing for us to think about. Every day we read these scary stories about confidential information being compromised, all around the country, that’s why I think we in the dispute resolution field and in the legal field need to build our own tools with very high standards of encryption and information security built into them, so that we can credibly say to our parties, yes, your information will be secure. Jim Calloway: Well, you’ve mentioned ethics and confidentiality; are there some new ethical standards that will be required to regulate ODR as opposed to ADR? Colin Rule: Great question, and actually I think there are. This is something that the Association for Conflict Resolution and the American Bar Association Dispute Resolution section are both working on. The key issue is, we have ethical standards for people who are serving as mediators and arbitrators and those are well-established, and they’ve been put together for almost 20 years at this point. But, we don’t have good ethical requirements for the programmers who are going to be writing the software that administers these online dispute resolution mechanisms. And you can imagine, somebody could build a digital kangaroo court, where they collect information from one party and assure them that it’s going to be confidential, and then secretly they hand it to the other side. So, we’ve created an organization called ICODR, the International Council for Online Dispute Resolution, and you can learn more at HYPERLINK “http://www.icodr.org” icodr.org, and it has standards for Online Dispute Resolution platforms. It’s all backed by the National Center for Technology and Dispute Resolution at UMass Amherst, and we’re promoting these standards and we want to certify ODR providers to ensure that they abide by these new ethical standards. But, I think it is really important for the field to think about not only where we are today but also where we’re going, so that we can get ahead of this and get quality standards out there so that parties can be reassured, if they use an ICODR-certified platform, they know that their information is going to be protected. Jim Calloway: Before we move on to our next segment, let’s take a quick commercial break. Jim Calloway: Feel like your marketing efforts aren’t getting you the high value cases your firm deserves, for over 15 years Scorpion has helped thousands of law firms just like yours attract new cases and grow their practices. As a Google Premier Partner and winner of Google’s Platform Innovator Award, Scorpion has the right resources and technology to market your law firm aggressively and generate better cases from the Internet. For more information, visit HYPERLINK “http://www.scorpionlegal.com/podcast”scorpionlegal.com/podcast. Sharon D. Nelson: Is your firm experiencing missed calls, empty voicemail boxes and potential clients you will never hear from again? Enter Answer 1 Virtual Receptionists. They are more than just an answering service. Answer 1 is available 24×7. They can even schedule appointments, respond to emails, integrate with Clio, and much more. Answer 1 helps make sure your clients have the experience they deserve. Give them a call at 1-800-answer 1 or visit them at HYPERLINK “http://www.answer1.com/podcast”answer1.com/podcast for a special offer. Sharon D. Nelson: Welcome back to The Digital Edge on the Legal Talk Network. Today our subject is Expanding Access to Justice through Online Dispute Resolution and our guest is Colin Rule, who is Vice President of Online Dispute Resolution for Tyler Technologies. Colin, why don’t you tell us about some examples of ODR implementations currently underway and maybe stretch out a little bit and let us know how you think some of these are fulfilling the need for access to justice. Colin Rule: Absolutely. It’s a very, very exciting time in the ODR field. After talking about this for 20 years and trying to explain how I thought this could expand access to justice, I kind of feel a little bit like the dog that caught the car. Now we see ODR breaking out all over the world and it’s very, very exciting. In the UK, the Lord Chief Justice has announced a major initiative to completely rebuild their justice system and they have created a massive fund, 750 million pounds to do it, and they have decided to make ODR a central tenant of that. So they are creating something called Her Majesty’s Online Court, which is going to be an all online court using ODR techniques to deal with cases less than 25,000 pounds, civil cases. So that’s going to be a real tent pole in Europe, because there is a lot of people looking at how technology can expand access to justice there. In Canada, the British Columbia Ministry of Justice has launched something called the Civil Resolution Tribunal, which is actually intended to replace their small claims courts. So, essentially all of those low dollar value civil cases are going to be routed through the Civil Resolution Tribunal, which again is going to use ODR to provide fast and fair resolutions to citizens in BC. And I just got back from China about two months ago where I saw the Hangzhou Internet Court, where they are using technology in some very exciting ways to lower the bar for accessing the courts, enabling people to participate remotely. One of the big barriers to using the justice system has just been physical location. Sometimes the closest courthouse is two or three hours away and people just don’t have the time or the resources to get in there to make use of it. We also have a crisis of pro se self-represented litigants, and because they just can’t afford representation, either they don’t file into the courts when they probably should or they do file into the courts and they try and navigate it themselves and just make a hash of their case and get really terrible outcomes. So this whole notion of making every cell phone a courthouse in a sense and enabling people to use these tools to interact with the counterparties and find mutually agreed-upon solutions, I believe this is the biggest opportunity to expand access to justice in the last 100 years. And while I know some attorneys and judges and court staff may be a little anxious seeing technology come in and disrupting the way the system has worked, I believe if we get ahead of it and we think creatively about it, this is going to be a huge expansion in access to justice, particularly for people that have not been able to make use of the services of the court in the past. Jim Calloway: Colin, I have been working with our State Access to Justice Commission and Committees here in Oklahoma, and I am not surprised that Europe is out ahead on this, but have we seen much of this actually implemented in the United States and would you have any suggestions about where the low-hanging fruit or first steps are? Colin Rule: Yeah, the National Center for State Courts just put out a great white paper talking about the development of ODR, sharing some best practices gleaned from various courts and even legal service bureaus that have deployed it. And really, the work we are doing at Tyler is also very exciting. We just announced that we are working with the Ohio Court of Claims and there are a couple of other counties that are very close to launching live. I really think by the end of this year you are going to see 30, 40 active ODR initiatives in the US, working with legal service bureaus, working with courts, expanding access and I think it’s just going to grow from there. We have worked with the Dutch Legal Aid Board in The Netherlands on a big family mediation program. We have worked in British Columbia with MyLawBC, which is an access to justice portal. I think you are going to see all of these legal service portals start to integrate ODR and make that available to citizens across the spectrum. And I think it’s going to happen very quickly. I am thinking two or three years it will be available maybe to a majority of folks in the US. Jim Calloway: Well, that’s certainly fascinating. I haven’t really seen any legal change happen in that scale, so wish you the best on that. What about the idea that many people who really can’t afford lawyers, who are in poverty, may not have Internet access or even a permanent address, is that being considered in some of these systems? Colin Rule: Absolutely. It’s a great question. When I first started working with ODR in the early 2000s, people would say to me, but only rich people have computers, only rich people have access to the Internet, so aren’t you just building a justice system for rich people? And I think that was a valid concern, this whole digital divide. But what we have seen in the last 10 years is really the mobile explosion, and now what we are seeing is services like Modria and other ODR services are mobile first. And studies done by the Pew Center have found that 97% of Americans access the Internet almost on a daily basis. So I think that the mobile revolution has expanded the reach of technology significantly and ODR as it evolves is going to become more and more mobile. So I know here in Silicon Valley, I mean this is hardly representative of the rest of the country, but even when you check in to the homeless shelter in Silicon Valley, they give you a free phone. And we are doing work in Africa and Asia and even in India, where my cofounder is located, there are people that sleep on cardboard boxes every night in the street, but they have the phone right next to their heads, because that’s their lifeline to figuring out where work is going to be the next day. So we have a long way to go still, but I think that mobile is going to be the way that we can extend the reach of this technology. And much like telephones used to only be owned by rich people and now there are even initiatives paid for by the government to expand phone access, I think we are going to see that happening with access to the Internet as well. Sharon D. Nelson: Well, that really has been a remarkable piece. I am so glad Colin that we got to talk about access to justice here at the end, because I know Jim and I are both fascinated by the possibilities that technology affords and you have just been a wonderful, wonderful guest. It was great to hear much more about ODR, the history, how it works, et cetera, et cetera, and then to see what the future may hold in terms of the access to justice possibilities. I certainly hope you are right in all your predictions. We would like to see it go that way. But thank you again for joining us and taking the time from your day. Colin Rule: Thank you so much Jim and Sharon, it was a lot of fun. Keep up the good work. Sharon D. Nelson: We will do our best. And that does it for this edition of The Digital Edge: Lawyers and Technology. And remember, you can subscribe to all of the editions of this podcast at HYPERLINK “http://www.legaltalknetwork.com/”legaltalknetwork.com or on Apple Podcasts. And if you enjoyed our podcast, please rate us on Apple Podcasts. Sharon D. Nelson: Happy trails cowboy. Outro: Thanks for listening to The Digital Edge, produced by the broadcast professionals at Legal Talk Network. Join Sharon Nelson and Jim Calloway for their next podcast covering the latest topic related to Lawyers and Technology. Subscribe to the RSS feed on HYPERLINK “http://www.legaltalknetwork.com/”legaltalknetwork.com or in iTunes.